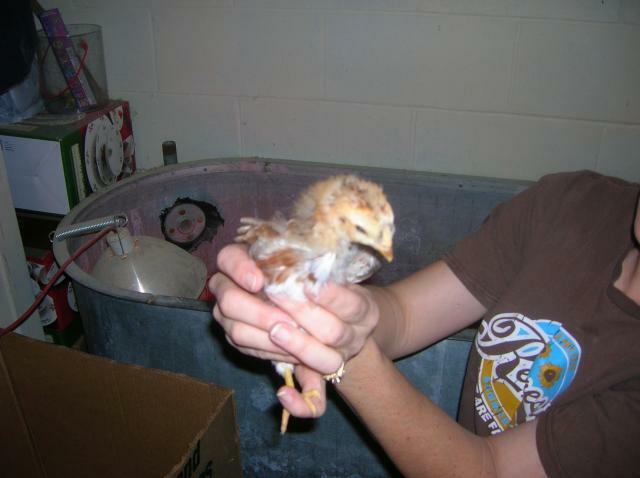 Living in western Nebraska on an acerage I mentioned to husband..."we should get chickens and have our own eggs." His reply was stern.."over my dead body will we have chickens." This past Spring my daughter and I went to the local farm supply store to pick up some supplies for our horses. The moment we walked in, I knew the store had gotten the spring chick delivery. 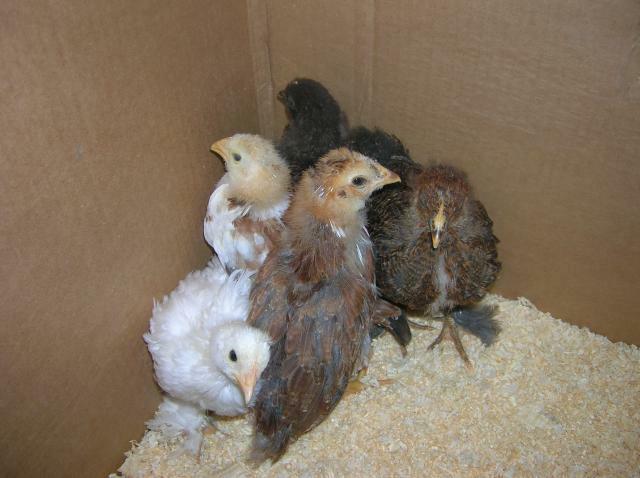 My daughter and I peeked into the stock tanks with the fresh pine shavings and the heat lamps and the next thing I knew 5 pullets made their way into a cardboard box and into my car. I keep telling my husband to this day, I don't know how that happened. Here is a story of will, determination and the transformation of stubborn opinion! Here are the baby girls in a stock tank in my basement....aren't they darling! Floor on pier blocks covered with 3/4" OSB. 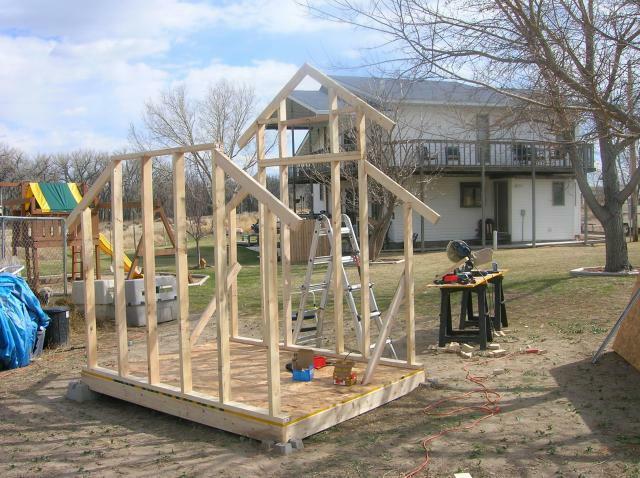 Framing with 2x4's begun. My husband had to come out and check my progress. My daughter took some of the pictures. The original floor was 6 by 8 feet. 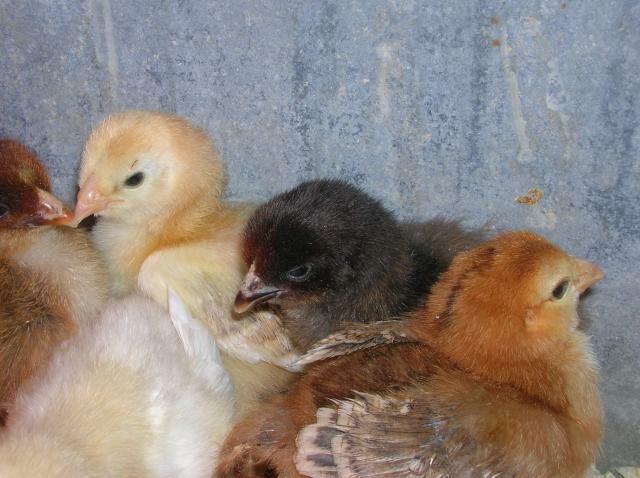 Plenty of space for 5 little chickens. The framing went fast and with my husband's help we had almost all of it done by the end of the day. Back wall is up and the reality of the size is starting to hit home. Did I say 5 chickens? Working on the rafters for the several levels of roofing. 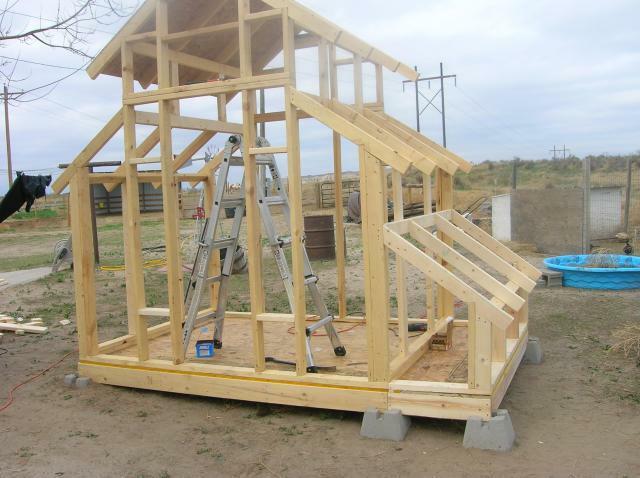 I had planned to keep it simple and have a single roof line, but I liked the looks of the green barn-style coop so much; I knew I would have always wished I had made it that way....so I did. 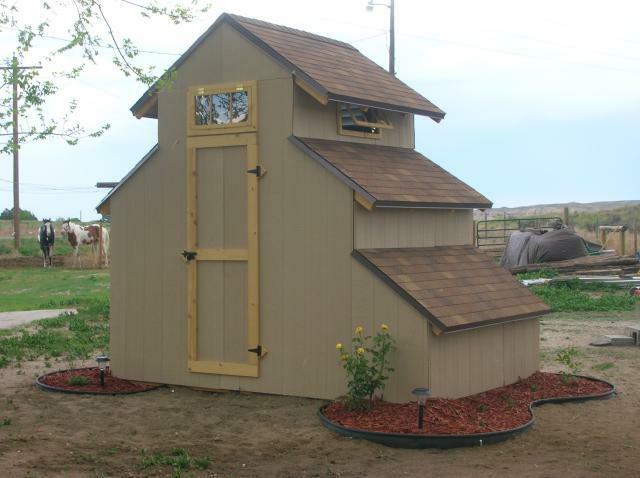 The coop I had seen on the design page had three levels on one side and I knew if I pushed the issue my husband would go over the edge. 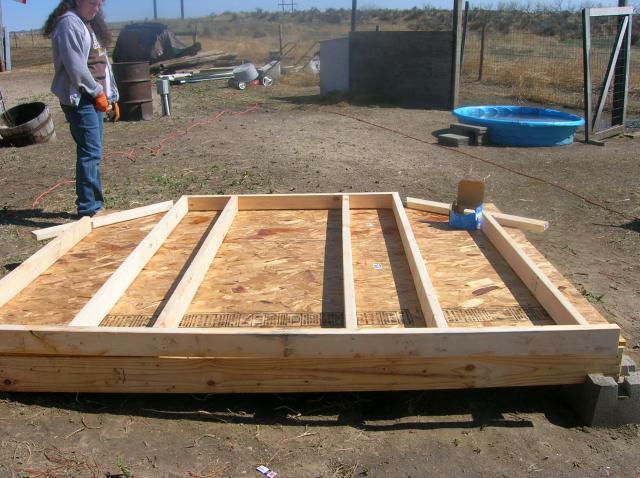 But he surprised me when he said we should add the little addition to the coop and without hesitation, I went back to the store in his pick-up for more pier blocks and wood. He was starting to come around! 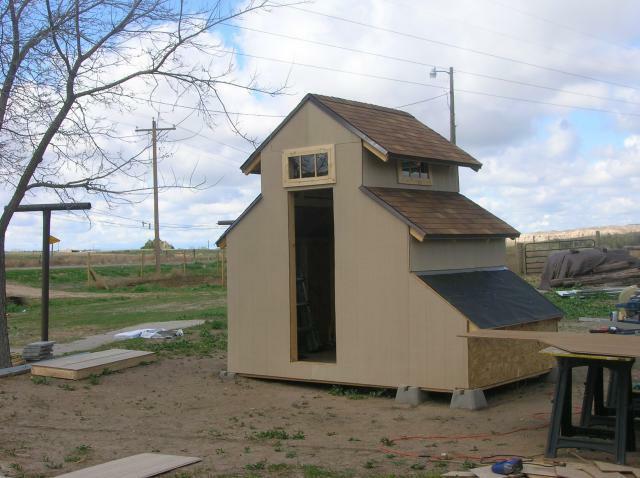 Here it is....the 2 x 6 foot addition and 3rd roof level on the coop's side! 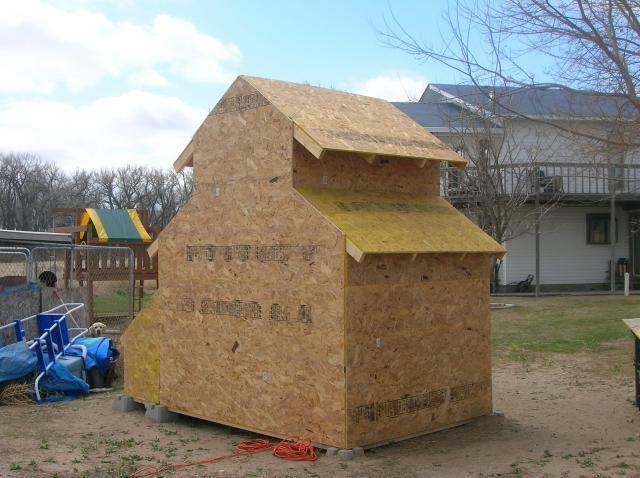 We began to apply the 1/2" OSB over the framing. Now it is really starting to take shape! 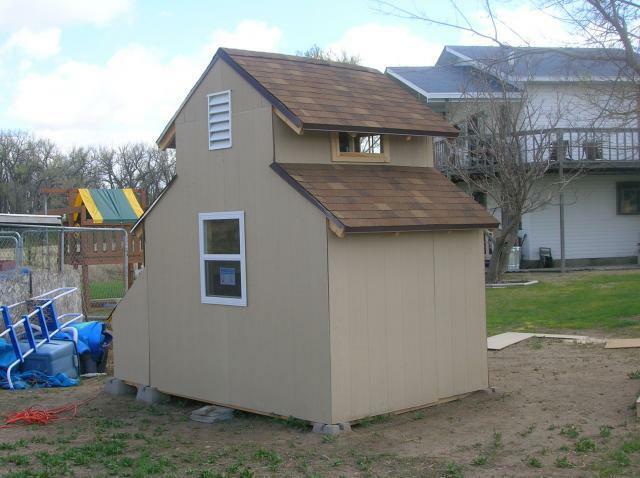 Looking like a real little coop! I'm starting to get excited to get the girls in it. Meanwhile in my basement, I had put the girls in a box upstairs to clean out the stock tank and put in new shavings. (Doesn't take long now for them to dirty up the tank!) As I'm cleaning, I can hear my husband upstairs...he's now peeking into the box and talking to the girls! I hear him saying to them..."peep, peep, peep." I think he is really coming around! This is Annie Oakley, she is a giant partridge. The other chickens all have names too. Fitting of the wild west of course. We have Mae West, Calamity Jane (Russians); Annie Oakley and Daisey Mae (Giant Partridge); and then there is Belle Star (Cochin). You'll see a picture of her later. With the girls getting ever bigger the pressure builds to get the coop done. Needless to say in April in Nebraska, the weather doesn't always cooperate! Done with the OSB! 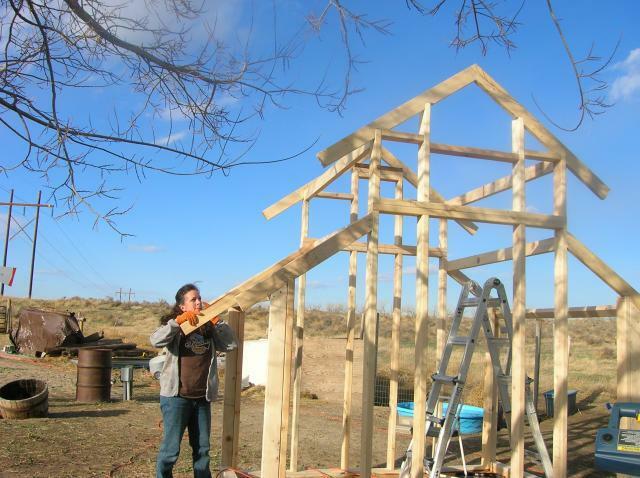 What a challenge to cut up under those roof lines and around the 2x4's! Starting the tar paper and valley metal for the roof! 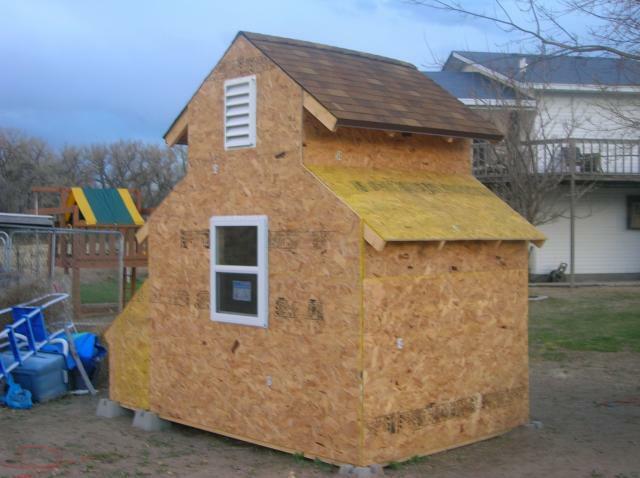 Shingles started, the vent placed and the rear utility window is in. The vent was around $20.00 and the window was $60.00. Would have liked to have found some windows to recycle like others on the site did, but we don't have many options in our area to find items to recycle. I now had another issue. 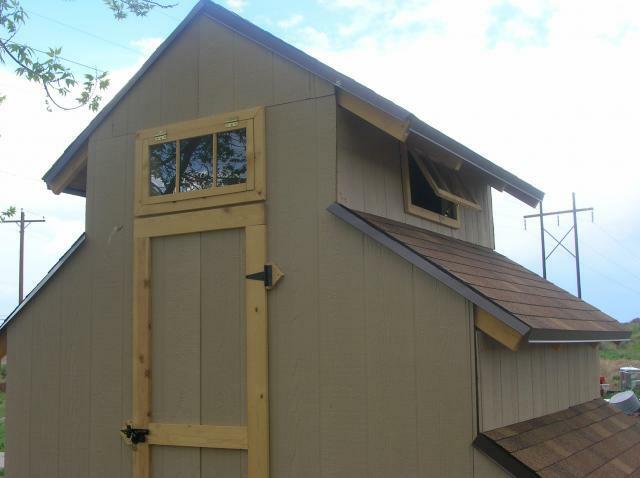 The coop I fell in love with had small windows along the top for ventilation. I needed to find windows which were no bigger than 12 x 24 inches. "Did you say I would have to Special order those and how much will that cost?" I will just have to make my own. So I called the local glass shop and they cut some glass for me #4 to be exact...just in case I broke one. The siding almost done, the shingles on and the homemade window in place. A few more windows in, one more layer of shingles to go. And now for the door. A close up of the homemade windows and the door. Have some more trim work to do. 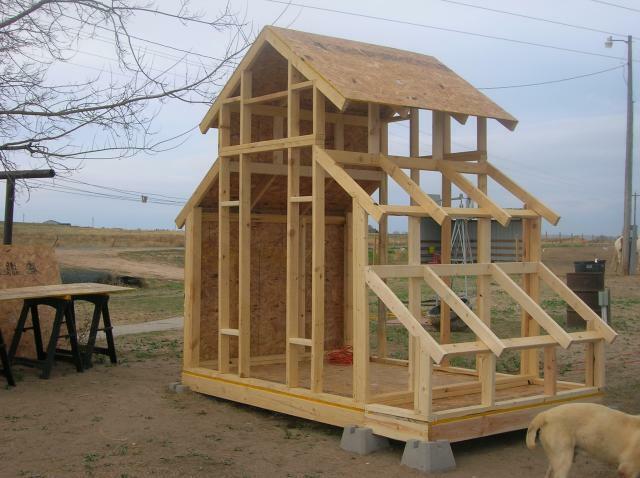 "Nice pics of the structural build and outside"
I wish there were photos of the inside and more to how you built it. I LOVE you coop. My husband is trying to replicate this on our level. However, I would like to show him inside pictures with the outside walls attached. I can't seem to get to the page 2 you refer to in your article. 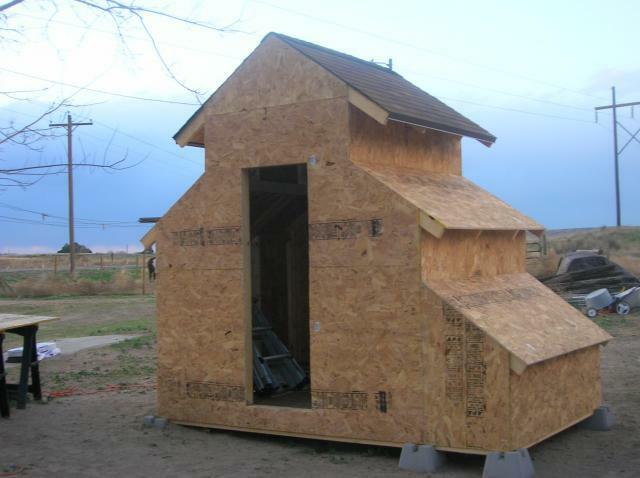 nice coop! has your husband come around? Mine thought i was nuts, now he loves them!